An automated weather station is situated in a sheltered valley at the Woodland Education Centre in East Devon, England. The weather station records the local conditions including rainfall, air temperature, wind speed, wind direction as well taking many more readings such as ultraviolet radiation, wind chill and dew point. The data obtained is regularly uploaded to these web pages throughout each day. 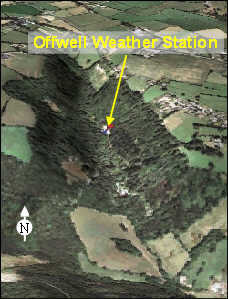 The Offwell Weather Station installation was funded by the East Devon Area of Outstanding Natural Beauty Community Project Fund, Offwell Environment Link and public donations.